Last year Air Canada launched direct flights to Casablanca, offering jet-setting Canadians a short 7 hour journey from Montreal to the heart of North Africa. After landing in Morocco’s most populous city I was quickly wooed by a modern metropolis, recognized by most movie buffs as the setting of the iconic 1940’s romance starring Humphrey Bogart and Ingrid Bergman. Sitting perched over the Atlantic coast, Casablanca is Morocco’s most cosmopolitan city and its economic anchor. Settled by the Berbers and successively inhabited by the Phoenicians, Romans, Portuguese and French, the dynamic port fully embraces its cultural diversity. 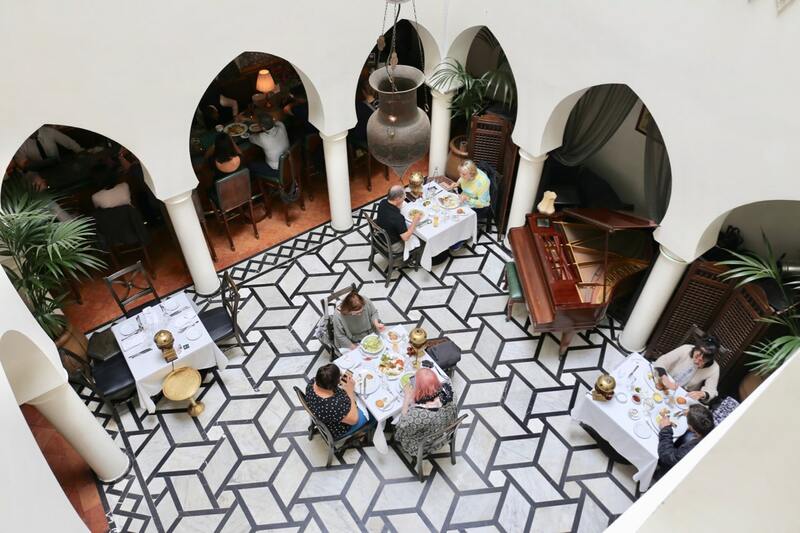 The result is a mix of whitewashed medinas and Art Deco landmarks, long-standing souks and thought-provoking galleries, which together reflect the buzzing face of modern Morocco. While most Moroccan itineraries tend to quickly graze over the city, I was keen to lavish in luxury while staving off that debilitating jet lag. 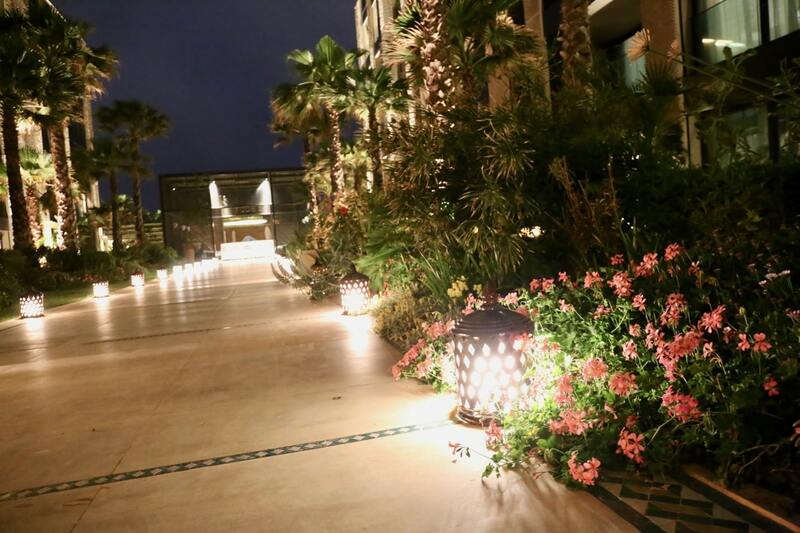 For like minded individuals keen to rest and relax before hopping on an epic Moroccan road trip, the Four Seasons Hotel Casablanca offers a sublime urban oasis featuring impeccable design lines, a trilogy of world class restaurants, and a restorative destination spa. With magnificent ocean views, Four Seasons Hotel Casablanca blends cool sand-coloured architecture with modern Moroccan elegance. Only five storeys in height, the intimately scaled Casablanca hotel features 185 spacious guest rooms, including 29 suites – most with private balconies overlooking the ocean or gardens. 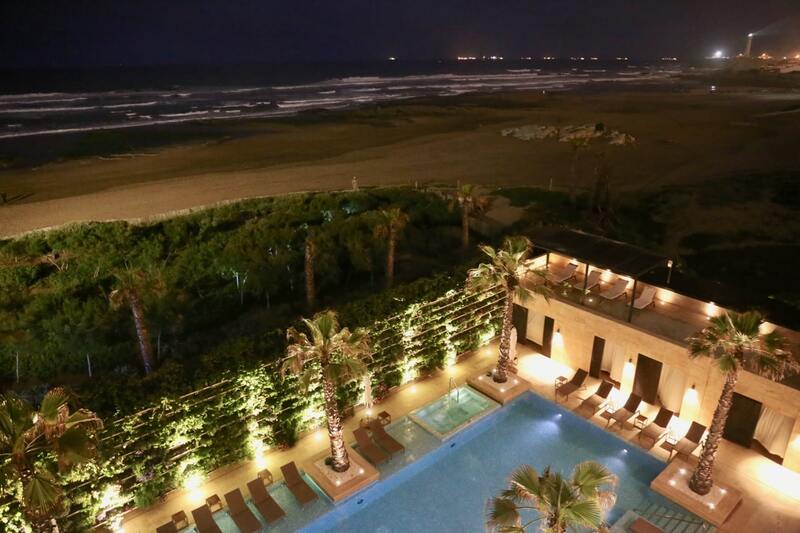 Located within the affluent Anfa residential neighbourhood, Four Seasons Hotel Casablanca enjoys a prestigious location on the Corniche, overlooking the coastline. Like a Casablanca beach resort, Four Seasons is part of Anfa Place, the first master-planned development on the White City’s shore. Designed by leading-edge London architects, Foster + Partners, the project harmoniously combines residential, shopping and entertainment. With modern Moroccan elegance, Four Seasons Hotel Casablanca offers the city’s largest luxury hotel accommodations. The look is fresh and contemporary, layered with traditional Moroccan details and splashed with locally inspired colours. While strolling through the hotel I was enchanted when looking down at my feet as the carpet has been designed to appear as though a collection of multi-coloured Berber rugs have been thrown across the floor. Every Superior Room at Four Seasons Hotel Casablanca elegantly incorporates contemporary flair with details inspired by traditional Moroccan design. Taylor made lamps inspired by typical brass work, Moroccan moucharabieh and Berber design elements come together to create the most spacious and luxurious guest rooms in the city, complete with floor-to-ceiling windows that let in a splash of natural light. Soft beige marble floors cover the room, providing excellent contrast with the dark brown timber and colourful décor. 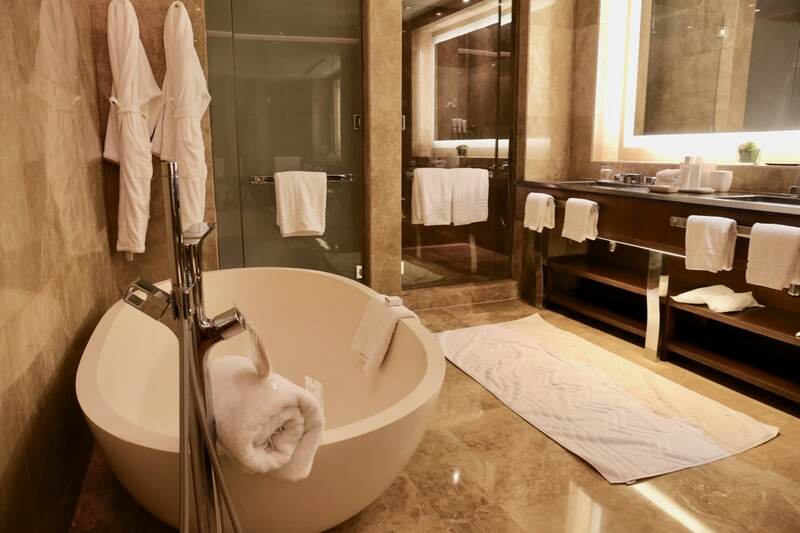 Marble bathrooms include a deep-soak tub perfect for a bubble bath and a separate glass-walled shower with luxurious Vrai toiletries by Fragonard. In all suites, the bathroom mirror features an integrated LCD TV so you can watch CNN to catch up on the news while brushing your teeth. Le Spa at Four Seasons Hotel Casablanca offers opulent luxury, elite skin care and massage treatments for those looking to rest and relax. Experience luxurious bespoke spa treatments with marocMaroc, that bring together ancestral Moroccan rituals with sublimely scented products. 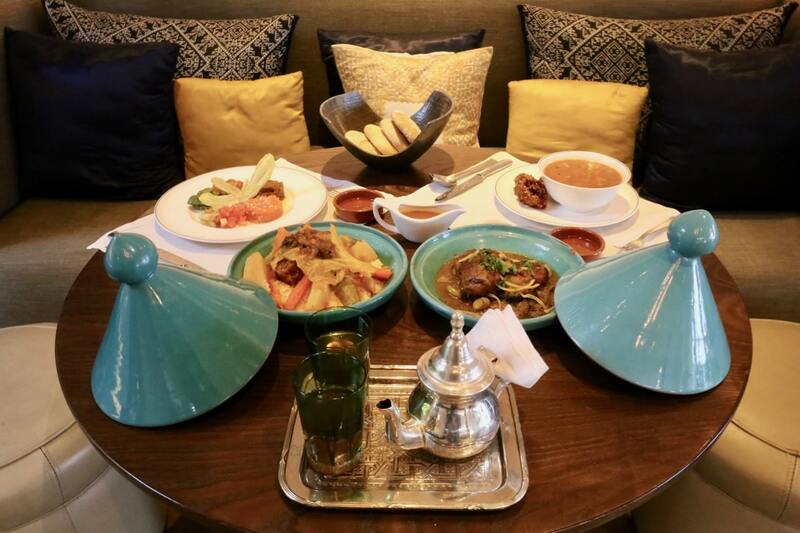 Discover heritage recipes enriched by the diversity of the Moroccan landscape retained by an exceptional knowledge of Argan, Orange blossom, and Rose; used daily by locals for health, cosmetics, perfumes or spices. 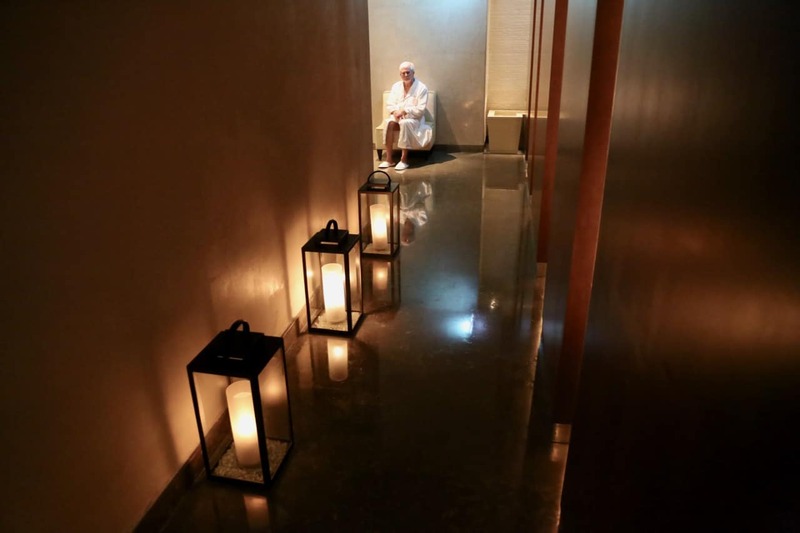 Le Spa’s Signature Anti-Jetlag Hammam was developed to eliminate fatigue and heaviness after a stressful overnight flight. Eucalyptus black soap scrub improves breathing discomfort while mint white clay action helps with circulation in the legs, providing freshness and softness. Afterwards, enjoy a sip of hot mint tea and relax in the spa’s heated whirlpool and steam rooms. 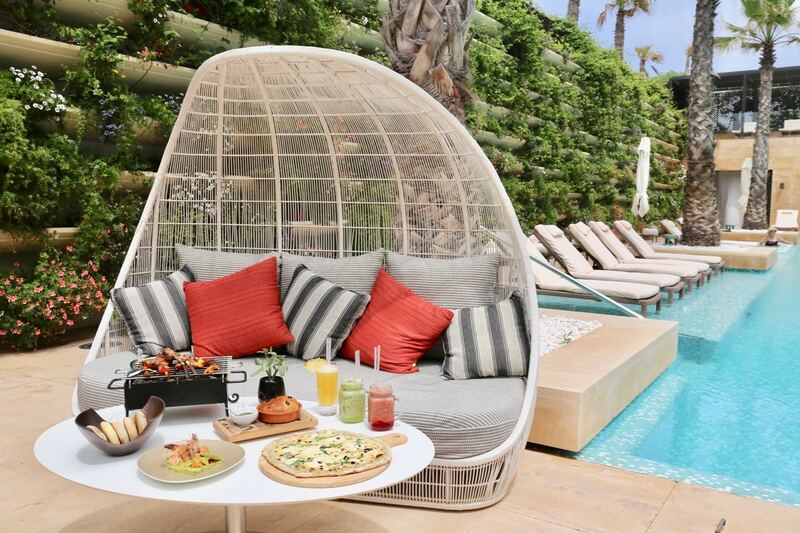 Latitude 33, the chic resort-style poolside restaurant at Four Seasons Hotel Casablanca offers an al fresco dining experience, named after Casablanca’s geographical setting on the 33rd parallel. Executive Chef Guillaume Blanchard’s menu offers a selection of vibrant shareable dishes, a perfect pick me up during the lunch hour. The al fresco space is a private oasis within the resort, tucked away from the beach and decorated with a jaw-dropping vertical garden. Highlights from the Latitude 33 menu include tropical fruit juices, shrimp and mango salad with yuzu guacamole, lamb, beef and chicken mixed grill, and truffle and burrata topped pizza. The hotel’s fine dining culinary showpiece is Bleu, offering cutting-edge décor inspired by Casablanca’s coastline. From waves to sea shells, the focus is on curves, creating a soft, relaxing ambiance. The white marble floor, wood columns and brown-leather banquettes create an elegant and contemporary flair. The interior offers wave-like, floor-to-ceiling windows, while the outdoor terraces feature a transparent glass railing and delicate white zelliges. 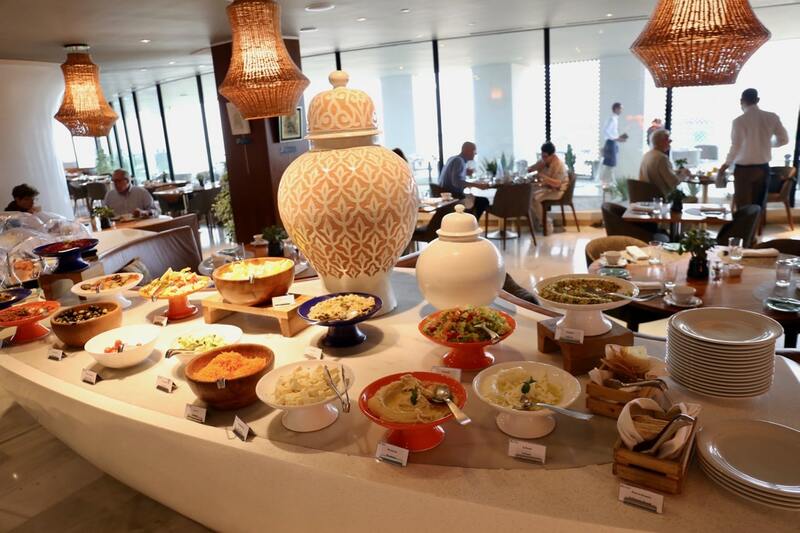 In the morning you’ll find Bleu bustling with hungry guests who indulge in the restaurant’s epic brunch buffet. Wake up to the world while sipping a cup of freshly brewed coffee as the roaring ocean kisses the beach below. Highlights from Bleu’s brunch include fresh fruit, yogurt parfait, cold pressed juices, a la minute egg station, cheese and charcuterie, traditional Moroccan and Levant dishes (couscous, labneh, hummus, moutabal), and perfectly prepared French pastries including almond and chocolate stuffed croissants and apple tart. In the evening Bleu transforms into an elegant and romantic surf and turf retreat. A custom-made grill in the centre of the restaurant exposes the chefs in action, while a raw bar features tartars, oysters and seafood tastings. 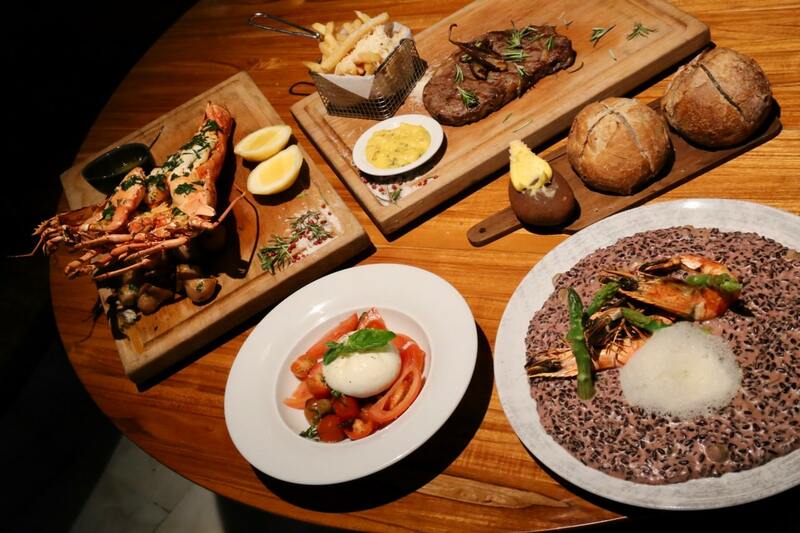 Fans of land and sea enjoy generous portions featuring a salad of tomatoes topped with plump burrata, creamy black risotto adorned with asparagus and shrimp, well-marbled ribeye with bearnaise, and eye-catching grilled lobster dripping with sweet butter and lemon. You can easily explore Casablanca’s top tourist sites during a leisurely afternoon. It’s best to start at the city’s landmark, the epic Hassan II Mosque. Everything about the Mosque is grand, from its 650-foot-high, green-tiled minaret, to the prayer hall that can squeeze in 25,000 worshippers. 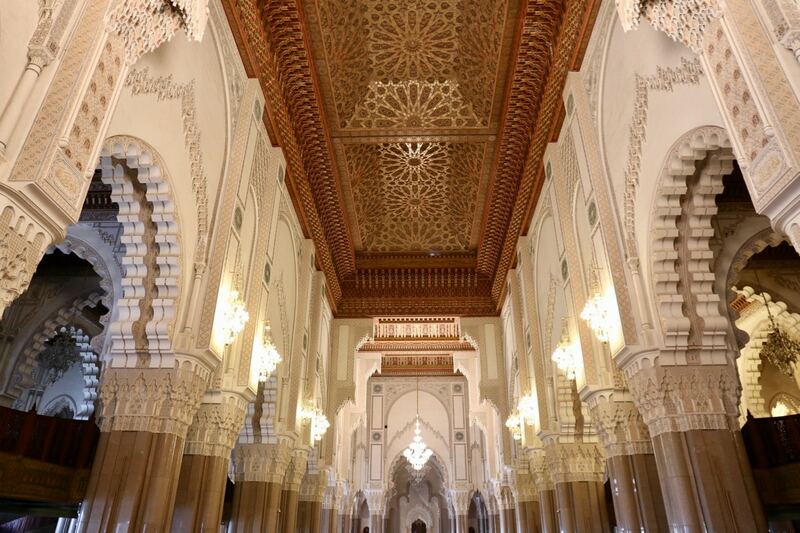 It is one of only two mosques in Morocco that non-Muslims which means visitors are free to marvel at the marble fountains, wood carvings and tile work that make the mosque a masterwork of Moroccan artistry. 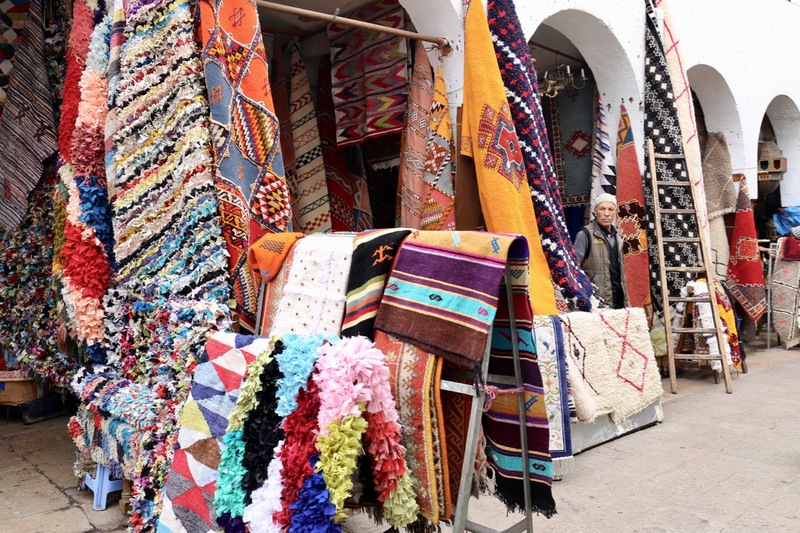 Quartier Habous (also referred to as New Medina) is the best spot in town to window shop for authentic Moroccan crafts. The area was developed in the 1930s by the French in an attempt to address the problem of an expanding urban population. The new medina is a facet of colonial town planning and its flower-filled, arcaded streets offer the opportunity for a stroll in a scenic quarter of the city. Stroll around the souk and you’ll find multi-coloured rugs, enchanting brass lamps, handcrafted leather slippers, and an endless array of olives. If you’ve got a sweet tooth be sure to enjoy a snack at the wildly popular Chez Bennis, Casablanca’s most famous patisserie, which sells a parade of pastries rolled in sesame, stuffed with marzipan and topped with honey. Morocco’s most famous pastry is the cornes de gazelle (gazelle’s horns), which Chez Bennis is most famous for. The beloved shop has been managed by the same family for four generations and to this day employs sisters, brothers, aunts and uncles who specialize in hand-crafting Casablanca’s most beloved sweets.